If there’s one common trait I’ve noticed among many modelers, it’s that most of us built models as kids, then drifted away to go about the business of growing up and starting a life, a career, a family. Years later, something brings us back. Maybe it’s seeing the latest FineScale Modeler on the magazine rack, the yearning to do something with your hands, or just the old itch returning. Or maybe you’re just picking it up for the first time. Either way, ramping up in this hobby can be a daunting thing. The internet and the global marketplace have opened up a veritable sea of tools, paints, and options. And don’t even get me started on the wondrous variety of kits, aftermarket accessories, and knowledge to be had. In many ways, the hobby is truly in a golden age right now, but if you’re just dipping your toe (back) into the water, it can all be a little bit overwhelming. With this how-to, it’s my aim to cut through to the heart of the matter – what do you need to accumulate to give it a go? First thing’s first. You need to find somewhere to build. This can be as simple as a cleared space on a desk, or a kitchen table. When I started out, I picked up a cheap $40 folding table from Costco. I’ve since graduated to a far more elaborate bench setup, but if you don’t know if you’re going to stick with it, there’s no reason to go all out. Yet. And something like a folding table can always be reused for other things if your flirtation with styrene doesn’t pan out. Once you have somewhere to work, you need something to work on. I know a lot of people out there advocate starting on the cheapest kit they can find. Something like the old Revellogram Dauntless. I’m going to disagree. First, I’d recommend you find a subject you’re interested in and do a search. Scale Hobbyist is a great place to do this – they allow you to filter by country, by scale, and by subject so you can see exactly what’s out there. Once you find something that strikes your fancy, check out the various options you have, and grab a decent, relatively inexpensive one. My personal recommendation – if World War II aircraft are your thing – would be to check out Tamiya’s 1/48 kits from the mid-90s. The P-51B and D, the F4F Wildcat, the Spitfire Mk.V, Bf 109E, and so on. These are simple builds with a limited parts count, solid detail and phenomenal engineering. See, in my opinion, the first build should be one that you have a blast with, not one that beats you down with terrible fit, lackluster detail and lots of repair work. Save those for once you’ve built your skills a little bit. Build the first one to build it. If you built models as a kid, you probably remember that Testors tube cement. Well, forget about it. Do yourself a favor and pick up three glues. The first – cyanoacrylate super glue. You can get this at any hobby shop, or you can just buy the Loctite stuff at Home Depot. The second – some high-quality white glue. My favorite is Gator’s Grip glue. It’s like Elmers on steroids. It’s in its element with small parts that aren’t load-bearing. So canopies, antennae and the like. The beauty of this stuff is twofold. First, you can work with it longer, which is awesome for positioning small parts. Second, it remains somewhat flexible, with excellent shearing strength. If you glue in an antenna with super glue, then accidentally hit it, the brittle glue will crack and the part will fly god-knows-where. With something like Gator’s Grip, you can just prop it back in place, no muss, no fuss. The third – and most important – is some form of solvent glue. 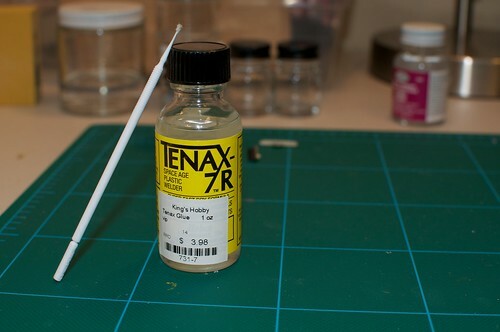 My preferred brand is Tenax 7R, but you can also look for Tamiya Extra Thin Cement, Testors Liquid Cement, Ambroid Pro-Weld and so on. All this stuff works the same, by actually melting the plastic slightly so that it welds together. The reason I prefer Tenax is that it’s hot, so it melts and welds FAST. No more having to clamp and tape things shut and let them sit overnight. It works in seconds. To apply the solvent glue, there’s a tool called the Touch-n-Flow, but I’d hold off on one until you’re sure you want to stick with this mad hobby. Instead, pick up a few microbrushes – the “fine” yellow kind. You can use these to pick up some solvent and swipe it over a join. You can invest a fortune in various modeling tools, but I’m going to keep it to basics here. Sprue cutter – this is a specialized scissor that cuts parts from the sprue tree. I prefer Tamiya’s side-cutters, but there are several brands and options that work just fine. Sanding sticks – pick up a pack of sanding sticks. You’ll use these to sand seams, clean up sprue attachment points, and so on. Be sure to work from coarser to finer grits. Tweezers – I’ve managed to accumlate a good half-dozen tweezers, but grab at least one. And get a pair that you have to squeeze yourself. The ones that close on their own have a tendency to catapult tiny parts into the unknown! A good blade – Pick up an Xacto knife with a #11 blade. This thing is useful all over the place. Toothpicks and q-tips – You’ll use these like crazy to hold parts, swab parts, apply micro amounts of paint, and so on. 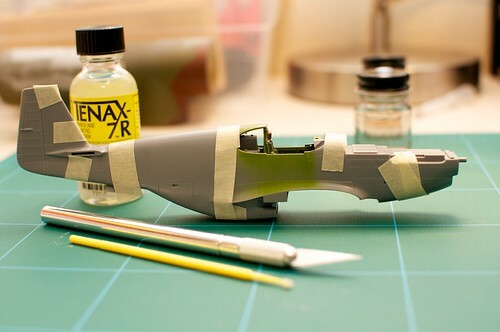 Tape – go ahead and pick up a roll of Tamiya tape. It comes in various sizes, but I use the 6mm the most. Good for masking, for holding parts together, and for holding parts down for painting. Obviously, you’re going to need paint. Do yourself a favor and DON’T LOAD UP. Don’t lock yourself into one particular paint brand just yet. Instead grab only what you need for your first kit. Also, take stock of where you’re going to be building. If it’s indoors without much ventilation, you’re going to want to go with acrylics, so look at Vallejo, Lifecolor and Model Master Acryl. If ventilation’s not an issue, Model Master enamels are a great workhorse paint and Gunze Mr. Color lacquers are probably my all-around favorites. Another common one is Tamiya “acrylics”, which I put in quotes because they aren’t true water-based acrylics the way Vallejo and Lifecolor are. Heck, you can thin them with lacquer thinner! They can be really great, but they don’t brush very well, so I’d recommend starting with a more all-around paint first. In addition to the straight-up paint, you’ll need primer (you can make due with a rattlecan of automotive primer for your first build). And thinner appropriate to the paint you select. Vallejo, Lifecolor and MM Acryl can all be cleaned up with Windex, too, which can make a great option. 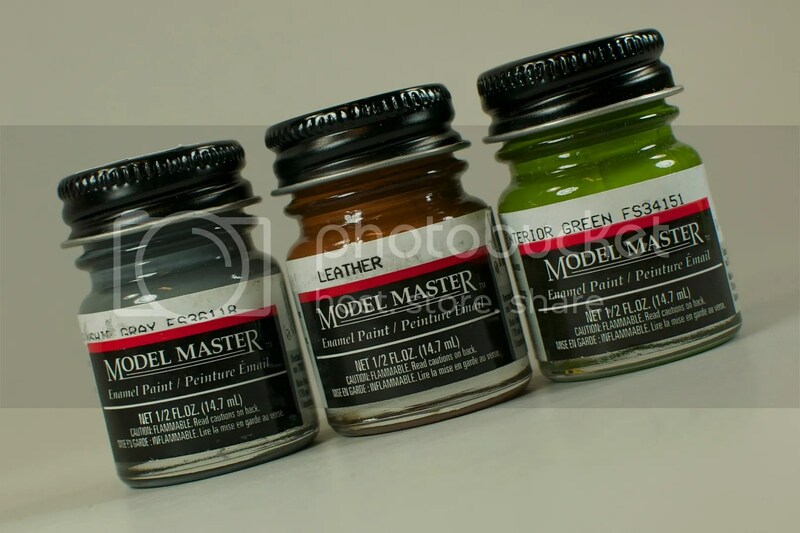 Model Master enamels thin best with their thinner, and Gunze and Tamiya paints thin best with high-grade lacquer thinners (or, in Tamiya’s case, you can also use isopropyl alcohol). You’ll also want some rattlecans of gloss and flat clear coats to prep for decals and then dull the finish at the end. To handle decals, pick up a bottle of Micro-Set (wetting solution for placing decals) and Micro-Sol (solvent that “melts” decals into surface contours). There are stronger decal solvents, but make that decision later on. I know there are people who rely on brushpainting or rattlecan work. I’m not one of them. In my opinion, this is one area that – while expensive – fully justifies the dive in. Pick up a decent airbrush and compressor (I’d recommend the Iwata Eclipse HP-CS, which you can pick up for a steal with the weekly 40% off coupon at Hobby Lobby). If the modeling thing doesn’t work out, you can make almost all of your money back selling it on eBay. And if it does, you’ll already have a good airbrush so you won’t be spoiling to upgrade immediately. Okay…so that’s still quite a bit. Ramping up is definitely one of the more expensive parts of the hobby. But a lot of things can be reused, or sold, and those that can’t (like paint), purchase only what you need and no more. And most of all – have fun with it. It’s a hobby, after all. Next Post What to take to ASMS ’12? Very well done Doogs. I will be pointing newbes in this direction. Great stuff here! where were you 4 years ago? haha! Your paragraph on “A Kit” is spot on. Starting with a crap-fit kit can make initial experiences unpleasant. 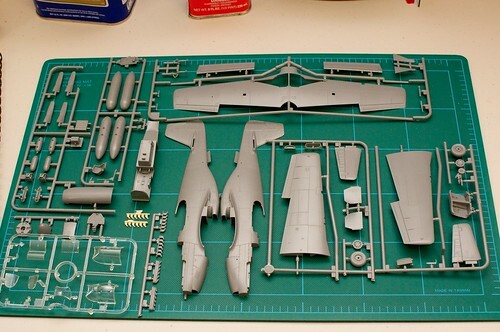 Starting with a solid Tamiya offering will show how far the hobby has come in parts engineering. One thing I would add to the glue dept is a “slow” plastic welder like the Testor’s in the black bottle. It gives you time to move pieces around and welds things together perfectly once cured. I use it on things that just need to go together and I can wait. But the Tenax is key for the fast stuff and for seams of course. But damn, this is some solid and simple tips. Thank you!